April 2018, 10th FAI World Paramotor Championships Lopburi, Thailand. Steward acting on behalf of CIMA the microlight & paramotor commission of FAI reporting on a full scale trial of a new kind of real-time data transmitting flight recorder. June 2017, Flew with Flying For Freedom / British Antarctic Microlight Expedition on the FAB17 expedition to fly the length of the western front in Belgium and France as it was on 7 June 1917, the day 19 mines were exploded at Messines. July 2016, Flew various Flying For Freedom / British Antarctic Microlight Expedition aircraft on the FAB16 tour of UK from Earls Colne, Essex to Kemble, Gloucestershire via John O'Groats, Scotland. December 2015, After 6 years, retired as President of CIMA, the microlight commission of FAI, the World air sports federation. Appointed FAI President of Honour. December 2014, Re-elected President of CIMA, the microlight & paramotor commission of FAI, the World air sports federation. November 2014, Technical Delegate on behalf of FAI to OCA Asian Beach Games, Phuket, Thailand. August 2014, Long range test of the Flying For Freedom / British Antarctic Microlight Expedition PulsR from UK to visit the World Microlight and Paramotor Championships in Matkopuszta, Hungary, and return. February 2014, Flying For Freedom / British Antarctic Microlight Expedition Cold weather testing in Northern Sweden. Unfortunate warm spell meant temperatures failed to get below -10c, some useful work done nevertheless, successful tests of skis on PulsR. November 2013, Re-elected President of CIMA, the microlight & paramotor commission of FAI, the World air sports federation. November 2013, 1st Asia - Oceania Paramotor championships & ABG Test, Phuket, Thailand Provided technical assistance to the the Royal Aeronautic Sports Association of Thailand to run both competitions, the latter as the trial for the 2015 Games. October 2013, Appointed Technical Delegate to the OCA 2015 4th Asian Beach Games by FAI Executive Board. November 2012, Re-elected President of CIMA, the microlight commission of FAI, the World air sports federation. September 2012, Kings Cup, Thailand Provided assistance in partnership with the the Royal Aeronautic Sports Association of Thailand in the form of a training course for competition officials in south-east Asia and technical assistance in the annual Kings Cup paramotor competition. July 2012, Adventure is GREAT Appointed 'sporting ambassador' to the adventure strand of this British government campaign to extend on the successes of the jubilee, olympic and paralympic games to promote Britain around the World. June 2012, 3rd Asian Beach Games, Haiyang, China As technical delegate to the paramotor competition, helped to guide the event to a very succesful conclusion. The event was notable for having the first fully integrated instant scoring system for paramotor competitions developed in cooperation with Swiss Timing. Attended a reception hosted by The Queen and The Duke of Edinburgh with the theme 'Adventurers and Explorers'. Explorer awards are granted by the Committee consisting of people of exploration, journalists and laureates from the previous years. Explorer is granted to the most outstanding contemporary discoverers and explorers of the Earth. Previous recipients include Leo Dickinson, Reinhold Messner, Sir Chris Bonington, Bertrand Piccard, Sir Edmund Hillary, Doug Scott and Yves Rossy. November 2011, Re-elected President of CIMA, the microlight commission of FAI, the World air sports federation. August 2011, British Antarctic Microlight Expedition Appointed flying leader of this ambitious plan to be undertaken in 2013/14 by a group of wounded and injured servicemen designed to bring to the attention of Britain and British Business the urgent need to build self-sustaining activities that get our veterans back into work and daily life. The Expedition, in partnership with Help for Heroes will show their ability not their disability as we fly to the South Pole. April 2011, 3rd Asian Beach Games, Haiyang, China Appointed Technical Delegate for the 2012 Paramotor event to the Organising Committee to coordinate between the Organising Committee, the FAI and the Aero Sports Federation of China. January 2011, Himalayan Paramotor Yatra Assisted with the organization and scoring of this succesful tour/competition in Nepal. September 2010, Maritime Africa - Zanzibar Second part of a five part TV series with a flying inflatable boat based on islands around the African coast. August 2010, European Microlight Championships, Sywell, UK Scoring director of the first microlight championships to have no official protests. June-July 2010, Maritime Africa - Cabo Verde First part of a five part TV series with a flying inflatable boat based on islands around the African coast. December 2009, The Noughties: a decade of adventure Included twice in an article by Tarquin Cooper in the Daily Telegraph charting the daredevils, never-say-die attitudes and disasters that came to define the people who pushed themselves to their limits and beyond during the past 10 years. November 2009, elected President of CIMA, the microlight commission of FAI, the World air sports federation. (retired as FAI Section 10 editor). October 2009, 2nd China International Air Festival Placed 20/37 in the open Paramotor competition at Laiwu. August 2009, World Paramotor Championships, Nové Mesto nad Metují, Czech Republic. Competition director of the largest Paramotor World Championships yet; 120 competitors from 18 nations. The most significant novel feature was an on-site intranet, mirrored to the internet, providing team leaders, competitors and organization staff with all necessary information at the same time, making this the first ever 'paperless' World Championship. July 2009 Blériot Centenary channel crossing Flew one of c. 100 microlights across the channel as part of the centenary celebrations with video for Tarquin Cooper of the Daily Telegraph. May 2009, Daily Telegraph Top 20 great British adventurers. Mountains, oceans, deserts - these individuals push the boundaries. No 9, in the exalted company of such greats as Sir Ranulph Fiennes, Sir Chris Bonnington and Sir Robin Knox-Johnston. May 2009, Centenary of the first flight by a Briton in Britain. Flew into Shellbeach landing ground 100 years to the day to participate in the celebrations at Muswell Manor, Isle of Sheppy, site of the first flight in an aeroplane 'by a British subject in the British Isles' on 2 May 1909 by J.T.C Moore-Brabazon in his Voisin 'Bird of passage'. April 2009, Royal Aero Club Norton Griffiths Challenge Trophy. Intended to recognise adventurous endeavours, this trophy is awarded to aviators undertaking outstanding feats of courage, tenacity and imagination unrelated to traditional sporting events. The splendid trophy celebrates its centenary in 2009 and is the RAeC's oldest award. Presented by HRH Prince Michael of Kent GCVO at the RAF Club, Piccadilly to Miles Hilton-Barber, Brian Milton and RMH for their flight from London to Sydney in 2007. November 2008, Diamond Colibri. No. 20 since 1990, awarded for an outstanding Microlight or Paramotor achievement by CIMA, the microlight and paramotor commission of the FAI in recognition of the 2004 Over Everest flight. August 2008, European Paramotor Championships, Lomza Poland. International Jury member on behalf of FAI CIMA. January 2008, Kilimanjaro; Roof of Africa expedition. Flew over Mt Kilimanjaro, Tanzania (19,340 ft) twice with David Barker and Fons Nijenhuis. On the same expedition Mark Jackson and Eve Jackson flew the aircraft to a new two-seat World altitude record of 7395m (24,262 ft) and World record climb to a height of 6000m of 25 min 48 sec. September 2007, World Paramotor Championships, Beijing, China. Pre-championship preparation monitor and International Jury member on behalf of FAI CIMA. May 2007, Awarded a 'Framed address' by The Air League; Presented by HRH The Prince Philip Duke of Edinburgh at St James' palace for an outstanding contribution to aviation, his many achievements with Microlight Aircraft and, in particular, in recognition of his amazing flight over Mount Everest in a Microlight Aircraft. March-April 2007, London-Sydney expedition. With very few days notice, flew a P&M GT450 microlight with blind co-pilot Miles Hilton-Barber from Rhodes, Greece to Sydney, Australia for the charity Seeing is Believing via Cyprus, Lebanon, Syria, Jordan, Saudi Arabia, Bahrain, Dubai, Oman, Iran, Pakistan, India, Bangladesh, Burma, Thailand, Malaysia, Singapore and Indonesia. 18,133 Km in 48 days (33 flying days) including more than 4,000 Km over open sea. August 2006, JCB Dieselmax. Support pilot for the successful Diesel land speed record attempt at Bonneville salt flats, Utah, USA. The car reached 350 MPH. August 2006, World microlight speed record, 145.6 Km/h over a 50 Km triangle Bonneville salt flats, Utah, USA in a two seater P&M Aviation Quik GT 450 with David Hoyle as crew. Ratified as a UK record 16 Nov 2006 and a World Record 4 Dec 2006. August 2006, European Paramotor Championships, Spain. Pre-championship preparation monitor on behalf of FAI CIMA. June 2006, Johan Bossuyt Trophy. Presented annually to an individual who gives generously of their time and energy to the development and promotion of Paramotoring. February 2006, University of Central England Received the honorary award of Doctor of the University (D Univ) from UCE Birmingham in recognition of distinguished aeronautical achievements. January 2006, Royal Aerosports Club of Jordan Invited to visit and advise RASC on their microlight operations at their base in and around Aquaba. January 6 2006, Record aerotow Towed a hang glider to 28,849 ft / 8793m over Rivadavia, Mendoza province, Argentina, the highest so far. 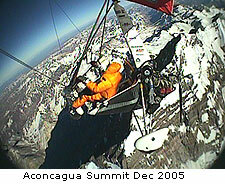 December 31 2005, Over Aconcagua expedition. Towed a hang glider over Acongagua, Argentina, the World's highest mountain outside the Himalayas, 6,962 m / 22,841 ft.
September 2005, Shanghai Qingpu Paramotor Open Helped organize the first major international Paramotor championship in China. August 2005, World Championships Organized the flight analysis and scoring for the World Microlight Championships in Levroux, France. May 2005, UK National Championships Competition director of the Paramotor class, pioneering a completely new type of championship system where pilots can fly any task they like whenever they like between the beginning and end of the whole championship. 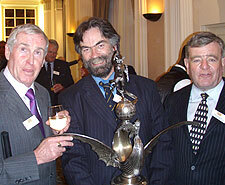 February 2005, Britannia Trophy (2nd time) Presented with the Royal Aero Club's premier award by the RAeC's President, The Duke of York For the British Aviator or Aviators accomplishing the most meritorious performance in Aviation during the previous year. Only the 60th time it has been awarded in 92 years. January 2005, best of ExplorersWeb awards. 3rd place, By their performance, the awarded expeditions have proved themselves outstanding in all or most of the following: Courage, Determination, Persistence, Self reliance, Ingenuity, Pioneering, Idealism, Comradeship, Compassion, Respect towards competition, Honesty. December 2004, Steve Hunt Memorial Trophy (3rd time) for outstanding microlight achievement by the British Microlight Aircraft Association in recognition of the success of the Over Everest Expedition. November 2004, elected the 1st Vice President of FAI CIMA, the microlight commission of the World air sports federation. November 2004, elected Editor of FAI Section 10 by FAI CIMA, responsible for the international rules for Microlight and Paramotor championships and records. 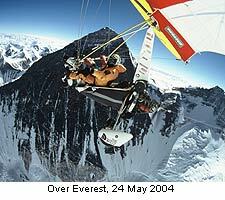 May 2004, Over Everest Expedition. 24 May. Aerotowed a hang glider to within 1000 ft of the summit and then flew to a maximum of 29,954 ft over the summit, taking unique aerial photos of climbers on it. March 2004, Aerotowed a hang glider to 25,280ft, Guidonia, Italy. August 2003, World Championships, Long Marston UK, Competition director of the Paramotor, PL1 & PL2 classes. May 2003, UK National Championships, Competition director of the Paramotor class. November 2002, elected chairman of FAI CIMA Flight Recorder Approval Committee to oversee the introduction of GPS based flight recorders into competition. October 2002, Blue Peter, Aerial cameraman for successful dual hang glider altitude aerotow record attempt by Judy Leden & Matt Baker. August 2002, European Microlight Championships (Paramotor), Nagykanizsa, Hungary. Competitor & British team leader, 2nd highest placed UK Competitor. July 2002, European Microlight Championships (Classic Classes), Nagykanizsa, Hungary. President of the International Jury on behalf of FAI CIMA. July 2002, Cloud Cookoo Land Pilot, camera platform for 35mm feature film, Lake District. June 2002, UK National Championships, Competition director of the Paramotor class. April 2002, Aerotowed a hang glider to 18,400ft, Pontarlier, France. December 2001, Established the COMPS website, www.flymicro.com/COMPS to record and archive microlight championships. June 2001 2nd World Air Games, Andalusia, Spain, Competition director of the Paramotor class. May 2001, UK National Championships, Competition director of the Paramotor class. April 2001, Tunisia to Sicily, aerotowed a hang glider some 900 Km and to a max altitude of 14,000 ft. from Tozeur in Tunisia to Catania in Sicily, including crossing the Mediterranean. 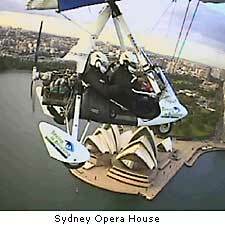 August 2000, European Championships, Levroux, France, Highest placed UK Paramotor Competitor. June 2000, Spanish National Championships & World Air Games test, Paramotor Competition director. June 2000, UK National Championships, Competition director of the Paramotor class. August 1999, World Championships, Matkopuszta, Hungary, Competition director of the Paramotor class. November 1998, Ashley Doubtfire Trophy, Awarded for Services to Microlight Aviation by BMAA for for his work organising competitions at the 1st World Air Games. November 1998, Appointed UK delegate to FAI microlight committee (CIMA) by BMAA. September 1998, World Cup, Matkopuszta, Hungary. Competition director of the Paramotor class. October - November 1997, ThrustSSC project; Pilot of support microlight, Nevada USA. Included return flight across the Sierra Nevada and California in 2 days and â‚¬ËœThe shockwave photoâ‚¬â„¢. August - September 1997, 1st World Air Games, Aydin, Turkey. Competition director of the Paramotor class. March - August 1997 UK Paramotor national championships, Competition director of all rounds. March 1997, 1Â½ day flight from Oxford to Bassano, Italy, to flight test Pegasus AX 2000 for Microlight Flying magazine. July 1996, British Microlight Aircraft Association FLM Office, Appointed part time consultant to the BMAA on all matters relating to the organisation of BMAA systems regarding foot launched microlight training and airworthiness. April 1996, 2Â½ day flight from Marlborough to Bassano, Italy, to flight test Pegasus Quantum 912 for Microlight Flying magazine. January 1996, Light Aviation Navigation Award by the Royal Institute of Navigation for 1995. September 1995, The Great Adventure, Madrid - London. Devised, organised and participated in (thought did not finish) this event which had some 80 entrants in 60 aircraft of which 15 aircraft finished. September 1994, Achieved the British Hang gliding and Paragliding Association's 'Club pilot' certificate to fly Paragliders. Started to fly Paramotors. May 1994, First tour of Ireland Rally. 3rd, 2400 Km in four days including flying to Ireland and back. June 1993, Madrid - Aubenas (France) 600 miles flight test of Air Creation XP for 'Ailes' Magazine. May 1993, Paris-London-Paris Rally. UK coordinator for French Rally. Largest ever mass channel crossings, 80 Machines involved, no losses! April 1993, Second team / individual, International meeting and show at Bassano, Italy. September 1992, Winner, Team, Bronze Medal individual, IV World Microlight Championships, Mattilla, Spain. August 1992, Elected Secretary of the Association of Microlight Professionals, an organisation established to represent the British Microlight Industry in negotiations to define a common European standard of airworthiness and operation of Microlights. May 1992, Winner, Masarik Cross Country, Czechoslovakia. April 1992, Winner Team, Second Individual, International meeting and show at Bassano, Italy. Jan - Feb 1992, Flight of the Dacron Eagles Pilot of camera ship microlight, on 1000 mile, three week journey filming for the BBC series 'Classic Adventure' with cameraman Sid Perou, a microlight and Hang glider expedition down the rift valley in Kenya. September 1991, Winner of the 'Grande Course', 2015 Km around France in three days. Awarded the 'Helice d'Or' for the third time. June 1991 Winner of the 'Great Microlight air rally' around Britain in five days. May 1991, Winner (Honorary) Spanish National Championships, Manresa, Spain. January 1991, Britannia Trophy, British team wins the Royal Aero Club's most prestigious award for it's achievements at the World Championships in 1990. May 1990, Winner '1000 Km de Beziers', France. Awarded the 'Helice d'Or' for the Second time. April 1990, Second International meeting and show at Bassano, Italy. Classification included winning the Pylon racing event. October 1989, Winner World Cup, held at 'Base ULM St Exupery', Montpezat, Southern France. Awarded the 'Helice d'Or' by F.F.PL.U.M., the French Microlight association. August 1989, Winner of the 'III Vuelta a Espana en ULM', 1438 miles around Spain in ten days. 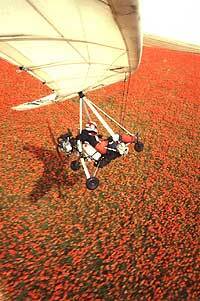 June 1989, Winner of the 'Great Microlight air rally' which included flying 1881 miles around Britain in five days. November 1988, Winner of the British national championships, 1988 (Open Class). Of the four rounds entered, three wins and one fourth place. November 1988, Steve Hunt Memorial Trophy (second time) for 'outstanding microlight achievement' in recognition of the success of the British team in Haverfordwest, at the British Microlight Aircraft Association's AGM. October 1988, Gold Colibri Award (No. 29) At the time the highest Colibri award issued by CIMA the microlight commission of the Federation Aeronautique Internationale, the international governing body of the sport. September 1988, Winner (Individual class A, and Team) , at the European championships held at Haverfordwest, Wales. November 1987, Winner of the British national championship league, (Open Class) awarded at the British Microlight Aircraft Association's AGM. Of the five rounds entered, four first places and one second. February 1987, Alps on Skis, Employed by Bladon Lines, a winter sports holiday company, to fly a microlight fitted with skis around all the resorts they operated in in the French Alps publicising the company and taking photographs for their forthcoming year's brochure. November 1986, Steve Hunt Memorial Trophy for outstanding microlight achievement by the British Microlight Aircraft Association in recognition of the success of the Trans Africa Microlight Expedition. 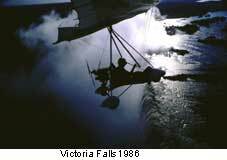 August 1985 - July 1986, Devised, organised and funded the Trans Africa Microlight Expedition. World record distance of 10,000 miles from London, through France, Italy, Greece, Egypt, Sudan, Uganda, Kenya, Tanzania, Zambia, Zimbabwe, Botswana to Cape Town, South Africa. The journey included the longest ever unsupported sea crossing (Across the Mediterranean from Crete to Alexandria), the first crossing of the Sahara desert by microlight, safe overflight of the civil wars in Southern Sudan and Uganda and the first attempt to fly over Mount Kilamanjaro, reaching 18,100 feet, just 1,200 feet below the summit. June 1985, flight from Lands End to John O,Groats. Forced to land 40 miles short of target but still beyond the existing World record (though never claimed) non-stop flight of 592 miles in 10 hours 51 minutes. June 1984, Gained PPL (D), the licence required to fly Microlight Aircraft.